T. 410 578 1919 F. 410 578 0058 Donate Today! Join us! This is Clayworks' 20th annual exhibition celebrating the talents and triumphs of our students and expertise of our instructors. CLAY FROM THE CLASSROOM showcases wheel-thrown functional ware, hand-built sculpture and figures created by children and adults in beginner and advanced classes. All work has been created on site in Mt. Washington and at our Community Arts Clay for All! satellite studios. This exhibition also includes ceramic work by our teachers who guide, challenge, inspire and instruct the creative community of Baltimore Clayworks. Check out our events page for more info on the Closing Reception! Artist Residencies: welcomed four new artists to the residency program. Education: offered an array of adult classes and increased our children/family drop-in programs in Mt. Washington + rebuilt the wood kiln! Community Arts: welcomed influential visiting artists over the summer, like Roberto Lugo (pictured above) and continued great work at partner sites. Exhibitions: kick-started the year with a huge hit, Michi, co-curated by our own Yoshi Fujii, and saw local, national and internationally recognized artists throughout the year. The Shop: started a 'Featured Artist' program, which has attributed to an increase in ceramic sales. There is so much more we are doing and will continue to do in 2017. With your support, Clayworks will continue to sustain and grow it's programming for years to come. Through our giving initiative, "Make, Share, Learn, Shop, CLAY!" we believe everyone has been impacted, can relate to or make a difference - all through the love of clay! Consider making your gift now to support our mission-driven programming and help us reach our end of year goal of $100,000 early. 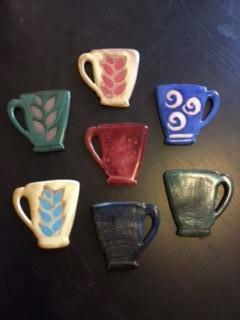 Make your online gift through the Clayworks' website today. 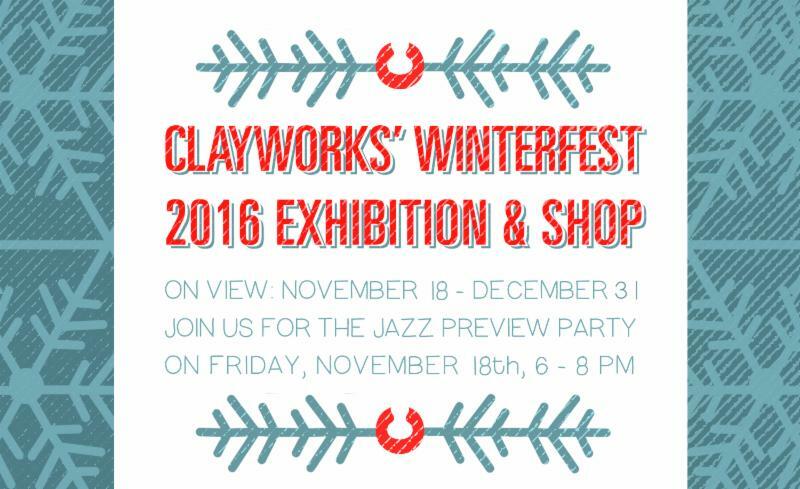 Join us for our annual Winterfest Jazz Preview Party in the galleries! This is a first chance opportunity to see and purchase work from the WINTERFEST 2016 exhibition and the HOLIDAY SHOP, while enjoying food, wine and live jazz music as you mingle and shop. This year, we ask in lieu of a ticket price, you consider making a donation (suggested $15 for members/ $20 for non-members) and bringing a small dish to share as part of a potluck. REGISTER TODAY! 1 DAY CLASSES, 2 DAY WORKSHOPS & 6 WEEK SESSIONS STARTING THIS WEEK! Make sure to check out our full class list online and sign up today. We've just added WINTER SESSIONS, which start in January. This short 4-week session allows for you to try out a beginner course you've always wanted to sign up for, build your skills in an advanced session, or just get your hands in clay with friends and family during our one-day classes and family programming. Join the Baltimore Clayworks Board of Trustees for a community meeting. This is an opportunity for our community members to directly address the board with any questions, suggestions and concerns about Clayworks operations, programs and mission. For more information and to RSVP in advance, visit the Events Page. Join us on the National Day of Giving! As part of #GivingTuesday, and Clayworks' "Make, Share, Learn, Shop, CLAY!" initiative, we will be hosting a happy hour and ornament making workshop in the galleries on Tuesday, November 29 from 6-8PM. This is an opportunity to sip a holiday drink, mingle, paint a clay ornament to take home with you, shop throughout the galleries and find fabulous ceramics in our WINTERFEST 2016 exhibition and HOLIDAY SHOP, while supporting Clayworks! For more information and to RSVP in advance, visit the Events Page.